Our Paris visit went on quite well, although we found it a little difficult to switch our senses ,which is now used to hearing and reading German, to French. More than once I found hubby dear talking in German while ordering food in France. And he looked super confident. Mind you, this is the same person who speaks in English while he is here. He logic was simple - most people here do not know German (hopefully), so I can show off whatever I know - heh,heh.. 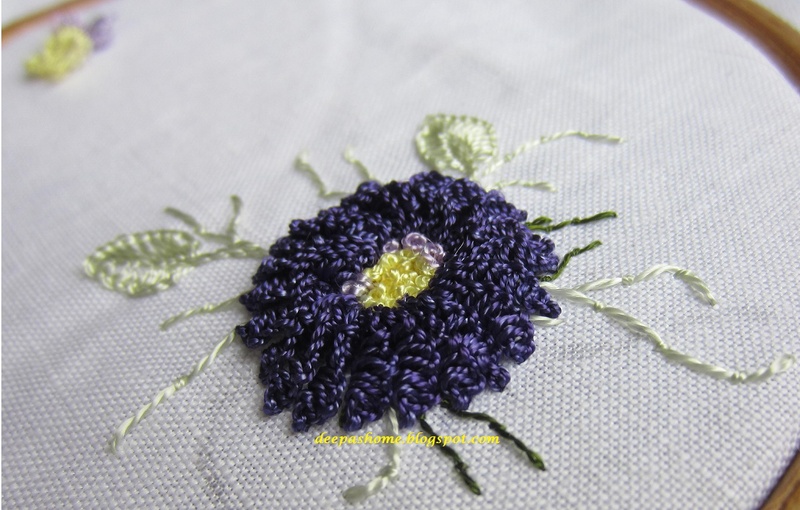 I have continued to add BE flowers on to the linen piece - this time vertically on one side. 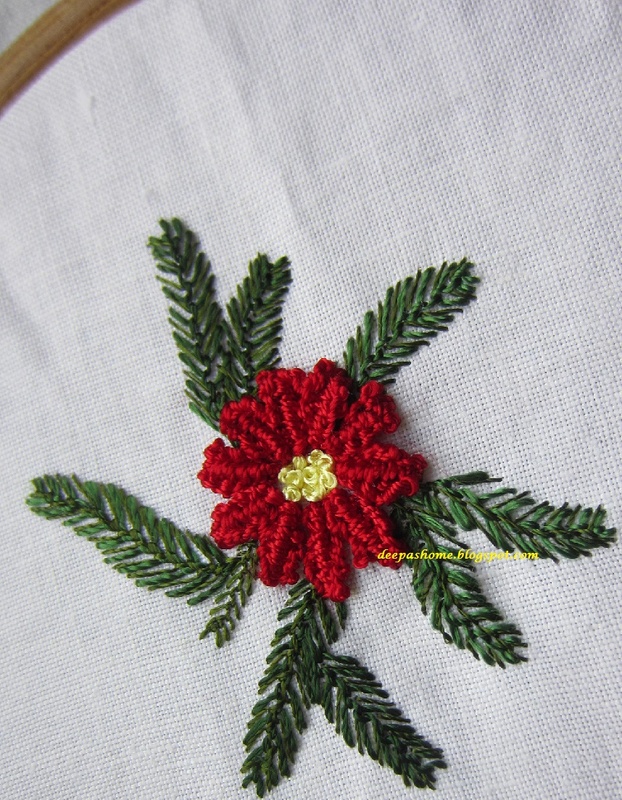 The stitch is a variation of cast on stitch and was a little tricky.The first couple of petals took several attempts.It is called Poinsettia - difficult but pretty. 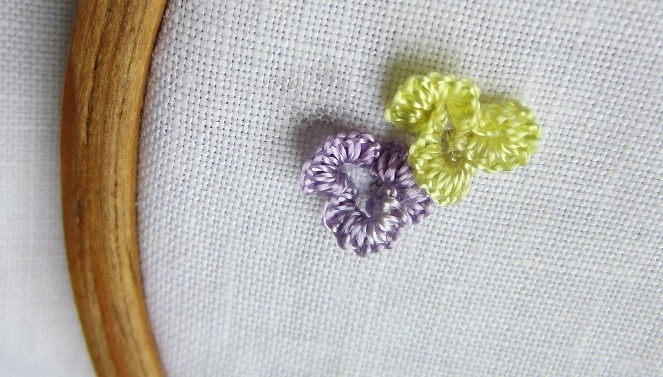 Then I stitched a simple cast on flower with a color I've never tried before. It is too dark and I am not too fond of it. I hope the yellow in the middle brightens it up a bit. It needs some more fine growth and wee bit of brightening up. 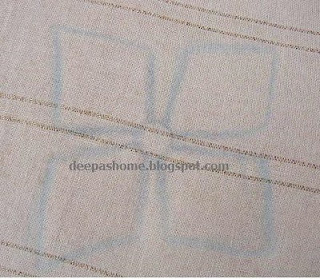 The Poinsettia and the cast on flower are along the width of the cloth - top and bottom. In the middle I am stitching some tiny cast on flowers again. But they are not looking too good right now. Hmm.. see,what I meant? I'll have to redo it. Let me just correct it and I'll be back soon.. Very pretty, Deepa! However, I'm not sure I would try that stitch, it looks very stressful! They look good to me. I've not tried cast-on stitch. It does create wonderful texture, doesn't it! Your flowers are wonderful (and I do love the blue one!!). I haven't done cast on stitch for ages and now I am inspired to try it again.